Blowout Sale! Save 68% on the Don't Count on It! : Reflections on Investment Illusions, Capitalism, ''Mutual'' Funds, Indexing, Entrepreneurship, Idealism, and Heroes by Wiley at HYIP Offer. MPN: 9780470643969. Hurry! Limited time offer. Offer valid only while supplies last. Q&A with Author John C. Bogle Author John C. Bogle In Don’t Count on It, you discuss how we deceive ourselves, particularly with numbers. In Don’t Count on It, you discuss how we deceive ourselves, particularly with numbers. Can you describe what you consider to be the absolute worst illusion investors fall prey to? The most damaging illusion for investors is their belief that they capture the stock market's return. For example, if the stock market provides an annual return of 7%, we know that the average investor's return will fall short of that by the amount of fees they pay. Those fees amount to about 2.5% annually for the typical investor, so their net return is down to 4.5%. Taxes might knock another 1% off of that, reducing the investor's annual return to 3.5% -- just half of the market's return. If you compound those figures over 50 years, $1 grows by $4.60 at 3.5%, and by $28.50 at 7%. In other words, the investor's cumulative return is less than 20% of the market's return. That's an enormous gap; one that can easily mean the difference between achieving one's long-term financial goals and falling well short of them. If you could change just one thing about the practice of capitalism today, what would it be, and why is it the most important? The biggest problem with capitalism today is our tremendous focus on the short-term. Institutional investors--who own 70% of our corporations--are predominantly concerned with whether or not the quarterly earnings of the companies they own will meet the stock market's expectations. As a result, our corporate managers move heaven and earth to try to meet those targets, so as to keep their firm's stock price high and maximize their stock-based compensation. But building corporate value over the long-term is hard; there are no quick or easy shortcuts. And as the past decade has demonstrated, decisions made to boost earnings and stock prices in the short-term tend to end up destroying shareholder value over the long-term. The sooner we can realign our focus from the short-term to the long-term, the better for all concerned. What do you think about ETFs? I like some; I am appalled by others. Specifically, I favor low cost ETFs that are focused on broadly diversified portfolios of stocks and bonds that investors can hold for a lifetime. These ETFs should provide investors with their fair share of whatever the returns our financial markets will provide. That's a winner's game. On the other hand, I'm not happy with ETFs--the vast majority--that exist to enable investors to speculate, to play their hunches on which country or market sector will outperform or underperform over the short term. The turnover rates are enormous, holding periods are measured in mere days, and costs are far higher than those levied by broad market ETFs. That kind of speculation is a loser's game. So I believe that ETFs have the potential to play a significant role in the portfolios of long-term investors. Unfortunately, to this point their use seems to be dominated by those engaged in far more destructive investment approaches. You talk about inspiring the next generation of leaders and your mentors in Don’t Count on It. What did your mentors have in common that you think is the most important trait in inspiring young people today? In other words, how can each of us be better mentors? I think at the most basic level, my mentors were good people; men of strong character who loved their work. They realized that the work they did made a difference in people's lives, and they did that work with a great deal of ability, pride, and professionalism. They woke up every day and tried their best to make the world a little bit better. That's what I took away from the relationships I had with my mentors, and the extent that I've been able to emulate them, I think, explains a great deal of what I've been able to accomplish in my own career. My views on mentoring have a lot in common with the themes of Don't Count on It. That is, these relationships are largely built upon trust, and attempts to quantify them are doomed to failure. Mentoring, in my mind, is less about helping someone fill out a checklist of accomplishments, and much more about passing along the immeasurable qualities one needs to be successful in their field --character, professionalism, honesty, intellectual curiosity, even humor. If you possess sufficient amounts of those characteristics, you're likely to be successful in whatever field you work in. "This collection of Jack Bogle's writings couldn't be more timely. The clarity of his thinking—and his insistence on the relevance of ethical standards—are totally relevant as we strive to rebuild a broken financial system. For too many years, his strong voice has been lost amid the cacophony of competing self-interests, misdirected complexity, and unbounded greed. Read, learn, and support Jack's mission to reform the industry that has been his life's work." "Jack Bogle has given investors throughout the world more wisdom and plain financial 'horse sense' than any person in the history of markets. This compendium of his best writings, particularly his post-crisis guidance, is absolutely essential reading for investors and those who care about the future of our society." "Jack Bogle is one of the most lucid men in finance." 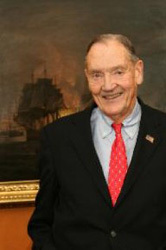 "Jack Bogle is one of the financial wise men whose experience spans the post–World War II years. This book, encompassing his insights on financial behavior, pitfalls, and remedies, with a special focus on mutual funds, is an essential read. We can only benefit from his observations." —HENRY KAUFMAN, President, Henry Kaufman & Company, Inc.
"It was not an easy sell. The joke at first was that only finance professors invested in Vanguard's original index fund. But what a triumph it has been. And what a focused and passionate drive it took: it is a zero-sum game and only costs are certain. Thank you, Jack." "On finance, Jack Bogle thinks unconventionally. So, this sound rebel turns out to be right most of the time. Meanwhile, many of us sometimes engage in self-deception. So, this book will set us straight. And in the last few pages, Jack writes, and I agree, that Peter Bernstein was a giant. So is Jack Bogle." 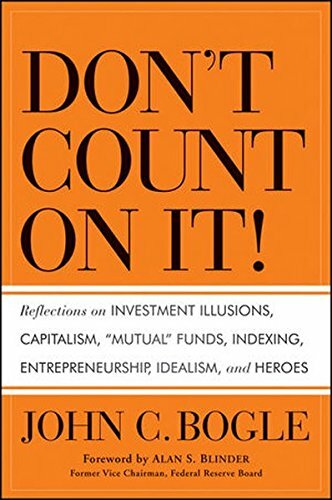 Widely acclaimed for his role as the conscience of the mutual fund industry and a relentless advocate for individual investors, in Don't Count on It, Bogle continues to inspire, while pushing the mutual fund industry to measure up to their promise.